Seiko Instruments Inc. also known as Seiko Seiki, manufactures a high speed, high rigidity spindle which is very popular with companies that perform precise internal grinding. 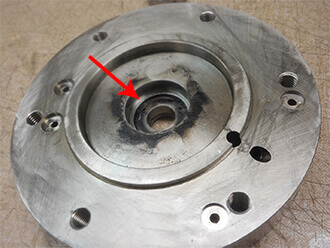 Your Seiko Seiki spindle is in expert hands with the factory-trained technicians at High Speed Technologies, Inc. We have repaired dozens of Seiko Seiki spindles to original factory performance. Need it fast? We can repair your spindle within three days of approval. All spindle repairs are backed by a complete warranty and our 30-year reputation of OEM-quality spindle repair. At HST, we replace all bearings with top name-brand ABEC 7 super-precision spindle bearings. Usually these spindles use a hybrid ceramic set of bearings due to their higher operating speeds. 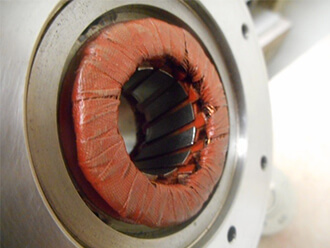 Your spindle repair will minimally include replacing all seals, grinding bearing spacers for proper preload and restoration of damaged shaft surfaces. Then we perform high-speed balancing to eliminate vibration, extend spindle life and improve finish quality on parts. 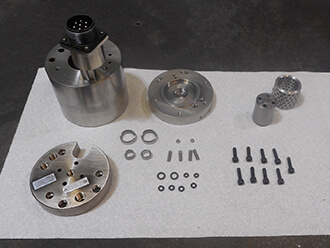 HST has provided the CNC machining community with a high-quality alternative to higher-priced OEM spindle repairs since 1986. 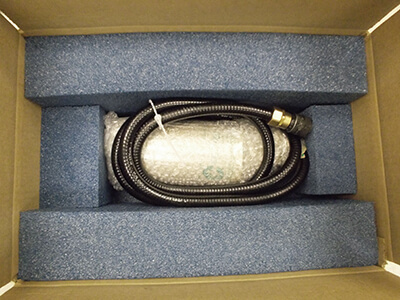 When we received this Seiko Seiki MH15 spindle from a world-class, automotive powertrain manufacturer out of New York, they made sure to mention that it only lasted five days in operation after being repaired by another spindle repair house. Upon disassembly we literally put the bearings under a microscope. Under magnification the #1 bearing showed evidence of a misalignment. As you can see in the pictures below, there was a narrow ball path on one side of the race and a much wider band 180° from it. This misalignment could have been caused by a couple of different things. But we narrowed the cause of the problem down to the front housing. Carefully mounting the front housing bore on our universal grinder we were able to determine that the housings bearing shoulder was .0008” out of square resulting in the misalignment we observed. A quick kiss grind squared up the shoulder and eliminated the cause of the misalignment. After correcting the housing shoulder, cleaning and inspecting all of the components and replacing all of the bearings and seals with new, the spindle was ready to be put back together. This particular model of Seiko Seiki spindle operates up to 150,000 RPM! So testing was very careful and slow. After minimal trim balancing, the spindle ran extremely well. No more misalignment. Like the previous mentioned spindle, this Seiko Seiki MH15 also arrived to us due to the lack of adequate repair from another spindle repair shop. Unfortunately, because it had already been sent to another spindle repair shop, it arrived to us in pieces. We therefore could not conclusively diagnose the cause of failure. However, the bearings did show damage that is indicative of overload. After testing the stator and inspecting the critical dimensions on the shaft and housing we were ready to install the new hybrid ceramic bearings and reassemble. Because of the higher RPM we had to proceed methodically and with caution. Before it was test run we had to verify that the shafts pilot ID and face measured 1 micron or below, which it did. This spindle passed all final test criteria and ran like new! 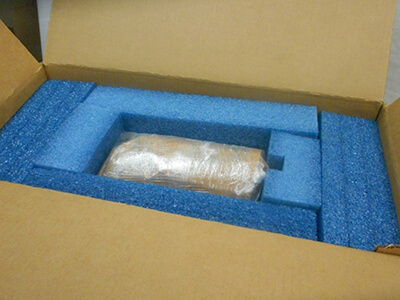 Seiko Seiki safely packed and ready to ship! 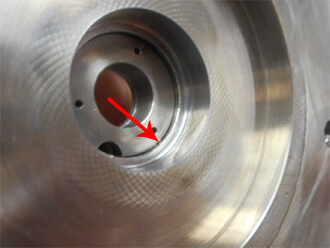 When we received the below Seiko Ltd. spindle from our customer in Asia, the shaft was locked up solid. There was also visual damage to shafts face. This spindle more than likely suffered from a crash. Once the spindle was disassembled we also measured excessive runout at the shafts front shoulder. So these two surfaces were kiss ground on our Kellenberger grinder. After repairing the shaft we ground the bearing spacers for a match fit and reassembled the spindle with new bearings and seals. At 80,000 RPM this spindle performed excellent! Wrapped up and ready to ship! Here at High Speed Technologies we love a happy customer! For expert Seiko Seiki spindle repair, please email or call us at 603-483-0333 for a free, no obligation quote. We offer one-year warranty and Quick-Turn-Around. We are fast, experienced and our work is guaranteed! !